This board is designed around NVIDIA's flagship nForce 590 SLI chipset with one purpose in mind: the ability to let your Core 2 Duo processor reach its maximum potential while still maintaining the low noise and power consumption benefits of this impressive processor series. An excellent overview of the Core architecture and a comparison to the current AMD architecture can be found in our Intel Core versus AMD K8 article. 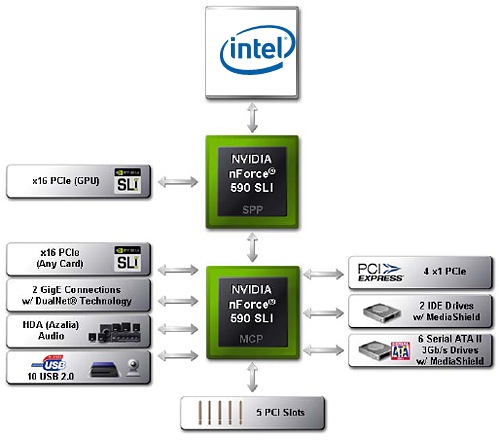 At the top of the product offering, the nForce 590 SLI consists of two chips, the 590SLI SPP and the 590SLI MCP. This solution offers dual X16 PCI-E lanes for multiple graphics card configurations. While other features have changed, the overall design is very similar to the nForce4 Intel SLI X16. The total number of PCI-E lanes is now 48, with 18 lanes coming from the SPP. Of those 18, two go unused at present and the remaining 16 are for the secondary PEG slot. NVIDIA will have the only chipsets in the Intel processor range that fully support SLI technology. Configuration 16, 16, 8/4/2/1, 4/2/1, etc. 16/8, 8, 4/2/1, etc. The star of the show is obviously the nForce 590 SLI chipset, although we expect to see exceptional price to performance ratios with the single chip nForce 570 SLI solution. Motherboards based on both chipsets should be available around the launch date of the Core 2 Duo. As we receive more information from the motherboard manufacturers we will pass it along in upcoming preview articles. There are a few points we'd like to highlight. First, while the nForce 590 SLI doesn't list Celeron D support, at least unofficially it should work. Intel didn't officially want their 975X chipset to support 533FSB processors, but a few motherboard manufacturers disagreed on this point, and the end result is that 975X motherboards are able to run Celeron D chips. We expect a similar situation to exist with nForce 590 SLI. Not that we would recommend putting a budget processor in a high-end motherboard, but at least you can if you so desire. The second point is on lane configurations. It's difficult to properly convey all of the options available with a simple features table, so here's a lengthier explanation. The combination of PCI Express lanes and slots can be tweaked according to individual manufacturer desires. In SLI mode, the 590 will always provide two X16 slots with X16 bandwidth and the 570 will provide two X16 slots with X8 bandwidth. Beyond that, many potential configurations exist. 590 SLI motherboards could offer two more X16 slots, but due to the lane configuration (30 lanes from the Northbridge and 18 from the Southbridge) the slots will be limited to a maximum of one X8 data connection and one X4 data connection. That would give motherboards a total of four X16 slots with varying bandwidth offered to each slot (2 X16, 1 X8, 1 X4). Considering the layout of expansion slots on ATX/BTX motherboards, this would be our ideal configuration, and the remaining expansion slots can be filled out with either X1/X2 PCI-E or regular PCI connectors. There really does not seem to be much point in including X1 physical slots, particularly on enthusiast level hardware, and ATI at least has already recommended that motherboard manufacturers begin including more X16 physical connectors. We've focused on nForce 590 SLI options so far, but the situation is similar with nForce 570 SLI, only with a lower number of total available lanes and links. The ideal configuration for 570 SLI motherboards seems to be three X16 connections, two with X8 links and the third with an X4 link; another option would be to provide two X2 links. Naturally, it is important to provide spacing between the X16 slots so that dual slot GPUs can be used without blocking access to the other slots. 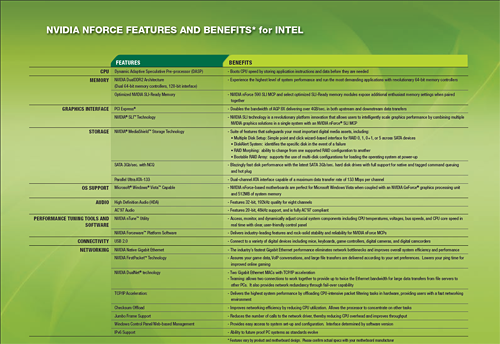 This is the basic overview of the individual features offered on the nForce 500 based Intel chipsets. The feature offerings basically mirror the AM2 release of the nForce 500 product family. 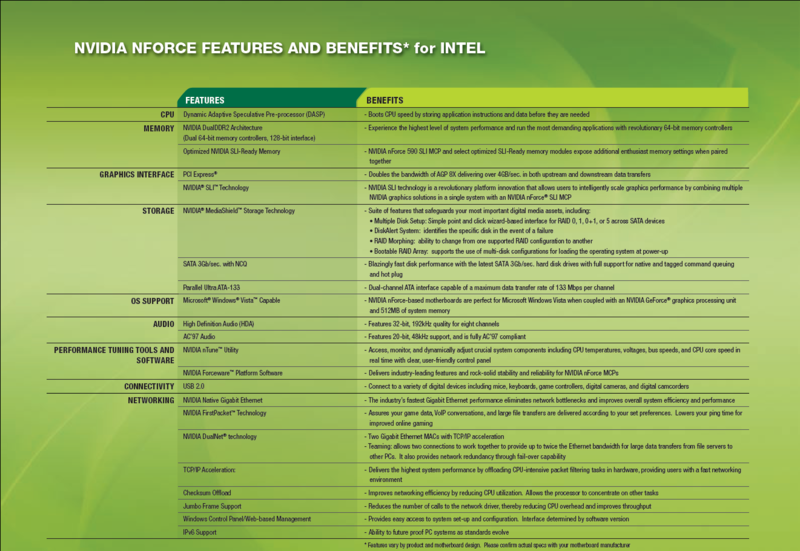 Additional information about these features can be located in our nForce 500 series chipset article for AMD AM2 platforms. Once again, the southbridge chip and fan are right underneath the top video card clot. A large cooling solution on the video card will completely cover the sb chip - possibily preventing the video card from seating correctly and certainly not helping with airflow. Please move the SB chip or get rid of the fan! Arrrgh! Probably should use DDR2 800 on the Asus and 667 on the 590 as the highest supported on each and recompare. I know that feels unfair but I'm saying that from a "highest supported" basis. Enthusiasts are likely to go beyond that, but you'll be giving the full oc tests a go in the next round. Initially however think 533 on both skewed things. "The reference board features an excellent voltage regulator power design along with Rubycon and Sanyo capacitors that yielded superb stability and overclocking results even with our early BIOS and board design." For some reason, pictures of the mobo wont show in Opera (v9) for me. The benchmark charts are there though. What gives? Anyone else experience this? First off, thanks for one of the very few test on the new nforce5 intel edition! For a long time now I have built my pcs with amd cpus, next month will be the first time since the first p3s that Ill build another intel pc! of course it seems natural to use an intel chipset for an intel cpu..
and perhaps someone knows of some tests on matrix raid 5? are somewhat supported by chipset hardware, not only the cpu!